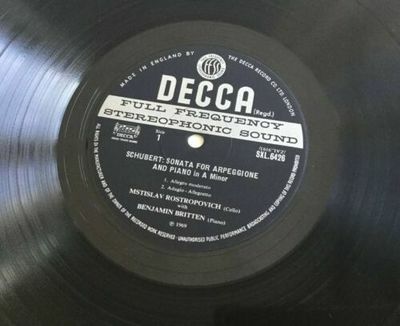 UK 1969 Decca stereo LP, a 1W/3W first pressing of SXL 6426, Schubert and Bridge Sonatas played by Rostropovich and Britten. Front laminated sleeve has corner bumps at the top, and one small bump at the bottom, with som light edge creases and flattening of the spine, and on the back there are the remnants of a price sticker, a scuffed section near the spine, some light ringwear and slight storage grubbiness. Still structurally excellent, and with very good colour, the sleeve grades VG plus to EX minus. Vinyl is superbly glossy, with a very clean surface; it has been professionally cleaned using a well-regarded brand of cleaning machine and quality cleaning fluid. Record is flat, no warp, and there are a few very light spindle marks on the labels. Side 1, band 1 has a small, light but visible line about halfway through, and a small light mark about two thirds of the way through which cause several light repetitive clicks. There are also a few very light hairlines. Side 2 has similar light hairlines, and a few extremely light hairline swirls. Audio throughout is strong and clear, but there is some light but obvious background crackle, heavier at the start of each side and then dissipating, and more prevalent on side 2. Taking visual and audio both into account, the overall grade for side 1 is EX minus, occasionally EX, and for side 2, VG to EX minus. This rare item will be very well packed in a sturdy protective box for secure shipping, and will be insured. I always combine shipping for multiple purchases.